With its decision to ban letters questioning AGW, the L.A. Times has entered the realm of leftist McCarthyism. 1. The Holocene interglacial, in which you find yourself living, is the coolest of the last 5 interglacials, by one to two degrees Celsius; the Holocene is also experiencing lower sea level than the interglacials prior. Compared to the Eemian interglacial (the most recent before it), sea level is roughly 4 to 6 meters lower today than, for instance, 115,000 years ago. 2. Arctic sea ice has been established in peer-reviewed papers to fluctuate dramatically, and was far lower than today 7,000 years ago during the Holocene Climatic Optimum. The papers’ authors showed that wave patterns on the shores of northern Greenland were one proof of several for the open ocean during the period. 3. Earth was rebounding from the recent temperature nadir of 1687, by about half a degree Celsius per century, long before meaningful emissions of carbon dioxide. To argue, as climate alarmists do, that the continuation of the warming is either worrisome or due to human emissions is an extraordinary claim. 4. Flat temperatures since 1998 among 3 of the 4 principal temperature data sets confound computer model projections from two decades ago (and since). 5. Antarctic sea ice has increased, steadily, throughout the period of satellite measurement that began in 1979. During the same period, the South Pole itself has cooled. 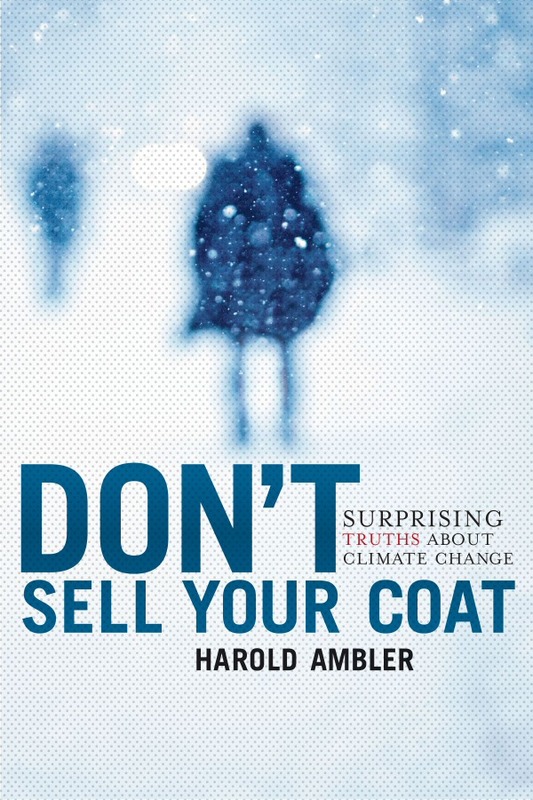 If you are curious about the facts that support the skeptic scientists’ position, I humbly recommend Don’t Sell Your Coat, which Freeman Dyson was kind enough to blurb. You can find it on Amazon. 2. Have total global sea currents increased or decreased in the volume of water that they transport, and have those currents brought relatively more warm water downward or cold water upward during the period? 3. Has total wind speed over the oceans increased or decreased during the past century and a half? (If it has decreased, even fractionally, this alone would warm the ocean temperature and then the atmosphere. Faster wind means more overturning of the water, which means colder water is brought to the surface). If wind speed were to decrease over the sea that could have 30 prime movers behind it, by the way. What you should be starting to glean, if you have read my questions at all seriously, is that temperature alone is an appallingly weak metric for heat in the ocean-atmosphere system. Heat/energy takes myriad forms! The simple truth is that we have measured temperature (imperfectly) for a quite short period of time and then decided that, since we don’t have similar global data sets for equally (or more) important metrics, we will allow temperature to stand in for the whole! As for sea level, in California where you live it hasn’t risen in more than three decades. If you ever go to the beach, then perhaps you noticed. With or without the blessing of the mighty L.A. Times, climate change debate will continue among scientists and interested lay people for decades, if not centuries, to come. In the meantime, you’re living in a wonderfully benign climatic moment in Earth’s history. Indeed, the IPCC’s most recent report posits no connection between extreme weather and putative manmade global warming (which, again, has yet to step beyond the bounds of past conditions!). As I show in my book, total acres claimed by forest fires was far higher a century ago in the U.S.; tornado activity is at historically low levels as I write this note; the last major hurricane to hit U.S. shores was more than 7 years ago; heat waves hit their maximum frequency and seriousness during the Dust Bowl; flooding has not increased in the Mississippi river system in two centuries; the worst time in terms of droughts that we know about for the American southwest was what peer-reviewed articles refer to as “megadrought” conditions, droughts that endured for centuries (not decades or years). May your personal understanding of climate continue to develop, and as it does so may your willingness to allow a free exchange of ideas develop as well. This entry was posted in climate McCarthyism, climate skepticism, L.A. Times and tagged Climate change, climate McCarthyism, climate skeptic, l.a. times. Bookmark the permalink. 3 Responses to You dare to question the great Los Angeles Times? Of course you realize, Mr. Ambler, that when you disprove the idea that global warming is caused by man and will destroy us all, they’re just going to come up with a new armageddon that is caused by man and will kill us all, don’t you? When I read, in Joshua Slocum’s memoir, “sailing alone around the world”, that he dined in South Africa with true members of the “Flat Earth Society”(late 1890’s) and they admonished him that he was not sailing around the world, but in it, I thought they most certainly could not still be alive. Yet here they are, at the L.A. Times. Pay no attention to that biased editor behind the op-ed page! The Great And Power LA Times has spoken! !